In the last month or so there have been terrible hurricanes, floods, earthquakes, and other natural disasters. These calamities have taken hundreds of lives and cause billions of dollars in damage to parts of the United States, Mexico and islands in the Caribbean. They are hard to understand and even harder to reason. Are they new? Did they happen like this hundreds of years ago? Has one ever happened here? Here in Canada, and especially in Ontario and in Toronto, one of the most terrifying, fatal and expensive storms that ever wreaked havoc upon our area happened in October 1954. This terrible storm was unlike anything that the people of this vicinity had ever witnessed. It was named Hurricane Hazel. When we read and watch the news about horrible storms like Irma and Maria, and see walls of water, trees uprooted, people fleeing buildings like the apocalypse is upon us, we think that this could not happen here and we thank our lucky stars. But it did happen here on Oct. 15, 1954. In 1954, Toronto was a quiet city and hadn’t had a great natural tragedy, not in our written history. That is not to say that there were not terrible storms and floods that wreaked havoc upon our beaches and waterfront, but nothing like the terrible tempest Hurricane Hazel. Hurricane Hazel came crashing — and I mean crashing — in on a southern wind with a natural vengeance that has not been seen since. There were warnings, but no one could anticipate the damage that the storm would cause. The storm came down on waterways like the Rouge and the Don Rivers, and especially the Humber River, with a fury that boggles the mind, as some old time Beachers will remember. Water levels rose up to 40 feet in some areas, higher than anticipated. It was phenomenal. The Beach area was hit very hard, but not as hard as other waterways. The waterway that felt the most of the hurricane was the Humber River and its northern watersheds. Do you have a personal memory of this storm? Let me know next time you see me, or send a note to Beach Metro News. I have a personal interest. I was born and raised in the Trinity Bellwoods Park area in the west. I remember going out at night to the store with my future sister-in-law Evelyn and being caught in the most violent windstorm I have ever encountered to this day. We were on Queen Street West, the both of us clinging to a steel pole and listening to the howling wind and rains. It was terrifying. On the news I heard that the Humber River had flooded, so the next morning I got on my bicycle and rode along Queen Street to the river. I saw houses coming down, the bridge was destroyed; it was a terrible sight that I will never forget. While I was surveying the damage, a police officer came over to me and chased me away from this tragedy. Hurricane Hazel was responsible for the deaths of 81 people. Hundreds of houses and buildings were swept away. Damages were in the hundreds of millions of dollars. It was like a bomb had been dropped on the area. The age of natural innocence was over, and it left a lasting impact on the land. 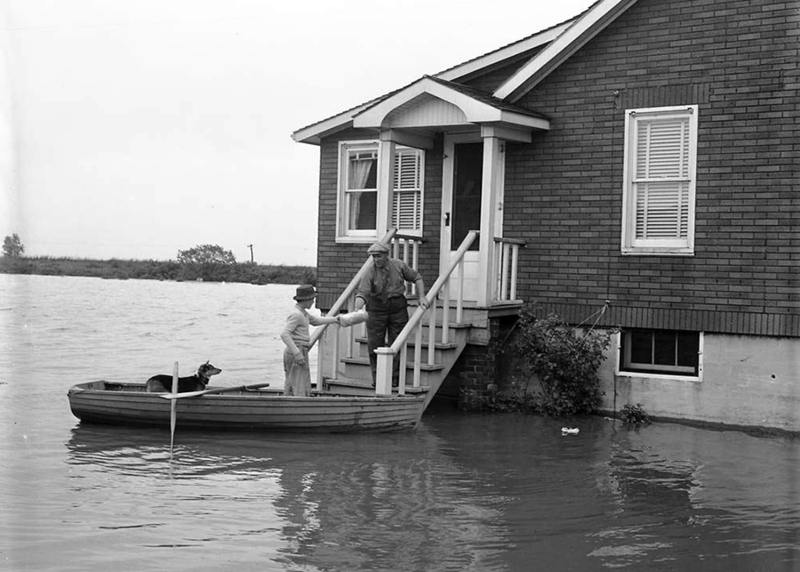 From Hurricane Hazel, different governments began hatching emergency plans for watersheds, rivers and lakes to cope with these natural phenomenons. Will we be able to cope if another Hurricane Hazel hits? Gene Domagala is a local historian and the unofficial Mayor of The Beach. I remember Hazel. We lived on Kew Beach Ave. at the corner of Woodbine. There was no Lakeshore Rd. then just what we called a cut across from Woodbine Race Park. I remember the water flowing down Woodbine to the beach and the lake. The water was up to the boardwalk. The water was so strong that uncovered the foundations of some old building that used to be there. Our cellar was flooded and all our coal was wet and ruined.